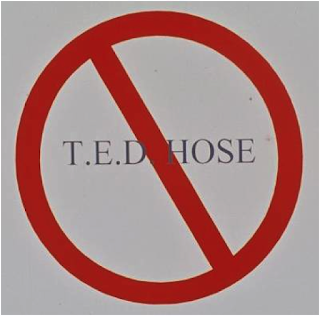 Are graduated compression stockings the same as TED hose? In a word: no. TED hose are not the same as graduated compression stockings. There are many people who do not realize there is a difference. T.E.D. is an acronym for Thrombo Embolic Deterrent, so T.E.D. hose are "anti-embolic" stockings. They are often worn after surgery to help prevent Deep Vein Thrombosis -- also known as DVT. They work well for this purpose, but they are only 8-15mmHg of compression. As soon as someone is out of bed post surgery and is able to stand, there is more pressure on the veins and the TED hose become much less effective. TED hose do not help with the symptoms of venous disease, nor do they halt the progression of venous disease. A graduated compression stocking prescribed for chronic superficial venous insufficiency is generally 20-30 mmHg, which means there is approximately 30mmHg of pressure at the ankle, 25 mmHg in the mid-calf, 20 around the knee, 15mmHg in the lower thigh, 10 mmHg in the mid thigh, and 5 mmHg in the upper thigh. This graduation encourages good venous return. Another difference is that, in general, compression stockings are much more tolerable to wear on a daily basis. Though compression stockings are much easier to put on than TED hose, they can still be difficult to put on. So if you are prescribed to wear either compression stockings or TED hose, ask your provider for tips -- or even coaching -- for how to put them on and take them off. (That's called "donning" and "doffing" in the compression business.) There are lots of online resources to guide you. If you have any questions about compression therapy or T.E.D. hose, contact us at the Vein Healthcare Center. We're here to help!